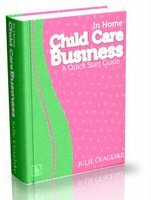 When you become a child care provider you will have to consider in the cost of daycare and what home daycare supplies you will need and supply for toddler and babycare. Your expenses will depend largely on what you already have and what your state requirements are. Toys, books, games, art supplies, etc. for various ages. Kid sized furniture- tables, chairs, high chairs etc. CD player or some type of way to play music, as well as CDs, tapes, etc. Babycare supplies such as diapers, wipes, formula, individual toys, blankets, ointments, bottles, cribs, baby food, etc. (Unless you require parents to bring them), infant seats. 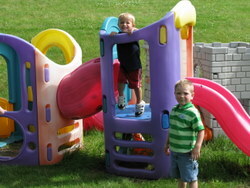 Outdoor toys and playground equipment (this particular cost can get very expensive) See my page on Used Playground Equipment and New Equipment for suggestions on saving some money! Training costs. Many courses/classes are offered through your licensing departing or local Child Care Resource and Referral and are free. However states require that you are certified in first aid and CPR and those classes typically are not free. Insurance for your home daycare. I would NOT be without this and some states require it. I would not omit this cost! Business home daycare supplies- receipts, file cabinet and file folders for each child’s information and for tax purposes, calculator, computer, etc. Phone and phone line. Your state may require you have a “land line” – not just a cell phone. Food! You’ll need a variety for different ages and for babycare in your home. Cleaning supplies are another cost. You never know when or where you’ll have unexpected spills or other types of “accidents”. Advertising costs… See my page on Advertising your Child Care Business it is the first step to your success on advertising for FREE! So when you Set Child Care Prices be sure you take these things into consideration.